The four main herbs that make up ESSIAC products are Burdock Root, Sheep Sorrel, Slippery Elm Inner Bark, and Indian Rhubarb Root. The four herbs may help normalize body systems by cleansing the blood, purging toxic build up, promoting cell repair and aiding in effective assimilation and elimination. Sheep Sorrel acts on the endocrinal system. Burdock Root apparently eliminates free radicals and purifies the blood. Slippery Elm is believed to dissolve mucous deposits in tissue, glands and nerve channels, soothing inflamed membranes and organs. Indian Rhubarb reportedly helps the body, especially the liver rid itself of wastes and toxins. ESSIAC products can be used to help support the Immune System, clean and detoxify the blood and vital organs, help prevent the onset of everything from colds to more serious health concerns. 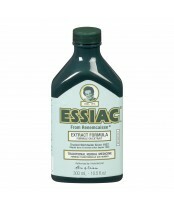 ESSIAC herbs are grown without the use of herbicides or pesticides. Used in Canada and exported worldwide. GMP compliance.